Summary: Sy Montgomery travels to the island of Moorea, near Tahiti, to work with a group of scientists who are seeking to learn more about octopuses (in case you’re wondering, this is the correct plural form of octopus. Octopod is also acceptable, but not octopi). Diving from numerous locations around the island, the team hunts for the elusive octopus, which can change into more colors than a chameleon and move its boneless body through tiny holes to hide. They’re looking to learn more about both the behavior and the psychology of the octopus, which has been shown in recent years to be remarkably intelligent. Interspersed with the story of the expedition are two-page spreads that give more information about octopuses, the scientists, and their research facility. A brief bibliography and index are included at the end. Grades 5-8. Pros: Part of the excellent Scientists in the Field series (“Where science meets adventure”), this book continues that series’ tradition of portraying science as an exciting adventure. Some days pass without a single octopus sighting, but this makes discoveries all the more rewarding. Readers will definitely want to make the acquaintance of an octopus when they finish this book. Cons: Maybe I am just getting older, but this book’s font seemed unnecessarily small. Summary: Madame Wigglesworth has always had a certain feline disdain for the humans she lives with, but they treat her worshipfully enough that she puts up with them. Until Grub arrives. Grub slobbers, eats Madame’s crown, and wants his belly rubbed…endlessly. Madame Wigglesworth decides it’s time to take matters into her own hands. She convinces Grub and his sidekick Honeybaked Hamster that the humans no longer love them and should be kicked out of the house. The animals drag the humans outside while they’re sleeping, then take over. Madame declares Petlandia a democracy, and bedlam ensues as cat and dog vie to become president. The house is combed for potential voters, including bats, rats, and fleas. 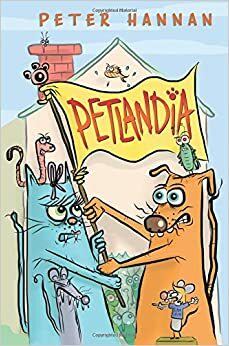 Can Petlandia survive political warfare? Ages 6-9. Pros: Liberally illustrated with cartoon animals, this is sure to be a hit for fans of Bad Kitty and the like. Even reluctant readers will find the combination of humor and action irresistible. Cons: My inner eight-year-old gave out around page 70, at which point the “humor” started to wear a bit thin for me. Actual eight-year-olds, though, will undoubtedly be giggling to the end. In a previous life, I was the librarian at the Museum of Science in Boston, so I kind of have a thing for children’s science books. Happily, there are lots of good ones so far this year. The great thing about science picture books is that they’re for everyone. Adults may find them just right to get a good introduction to a difficult topic. 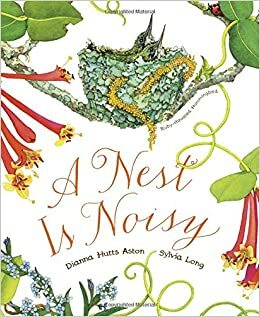 A Nest is Noisy by Dianna Hutts Aston, illustrated by Sylvia Long. Published by Chronicle Books. This author-illustrator team has produced another work of art about nature. Packed with fascinating facts about all kinds of animals’ nests and gorgeously illustrated, plan on spending a lot of time poring over this book. 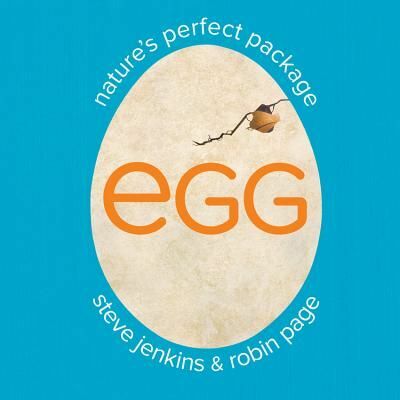 Egg: Nature’s Perfect Package by Robin Page, illustrated by Steve Jenkins. Published by HMH Books for Young Readers. Just in case you’re wondering about what goes inside all those nests. Another winning author-illustrator team, with phenomenally detailed cut paper illustrations and lots of amazing facts about all different kinds of eggs. A Chicken Followed Me Home! : Questions and Answers About a Familiar Fowl by Robin Page. Published by Beach Lane Books. 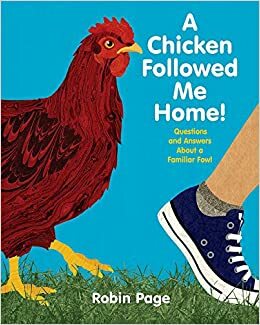 Apparently, Robin Page spent some time recently contemplating the whole chicken/egg question, because two months after Eggs was published, this book about chickens came out. A book about chickens sounds like it would be kind of dull. It’s not. 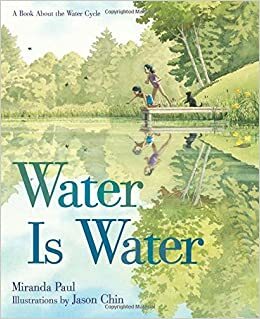 Water Is Water: A Book About the Water Cycle by Miranda Paul, illustrated by Jason Chin. Published by Roaring Brook Press. Here’s the perfect example of a book that explains a scientific concept in the simplest terms. The illustrations by Jason Chin are lovely, and portray children in everyday situations interacting with water in all its various forms. And speaking of the water cycle…. 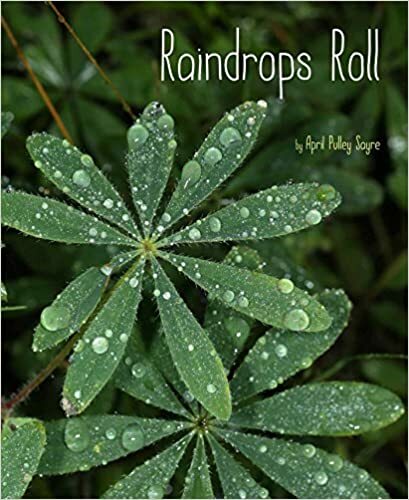 The amazing photographs in this book of things you might find in your backyard (flowers, birds, trees) will encourage readers to slow down and observe the world around them. 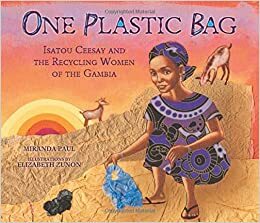 Summary: When Isatou Ceesay first discovers a plastic bag lying on the ground of her Gambian village, she is impressed with how light and strong it is for carrying things. Years later, she learns that goats are dying from eating plastic bags, and she starts noticing the bags are creating piles of nasty-smelling trash that collect water and attract mosquitoes. When she sees her sister crocheting, Isatou gets an idea. Before long, she’s assembled a team of Gambian women to crochet plastic from the bags into purses that they sell at the market. Proceeds from the sales can be used to improve life for all in Isatou’s village. Includes an author’s note about the real Isatou, a glossary and pronunciation guide of Gambian words, a timeline, and additional resources. Grades 1-4. Pros: An inspiring, true-life story about the power of an ordinary person to make a difference. The illustrations are a mix of paintings and collage, and every African woman’s dress is a gorgeous print. Cons: Ceesay (Isatou’s last name) and the name of her village, Njau, aren’t included in the pronunciation guide. Summary: 11-year-old Nell Warne has had a tough life, seeing her mother die, then her two brothers, and finally, her estranged father. With no other family left, she is unceremoniously dumped on her dead uncle’s widow, Aunt Kitty, in Chicago. Aunt Kitty has no interest in taking in an orphan. First of all, she blames Nell’s father for her husband’s murder. And secondly, she’s too busy with her career as the first woman detective in America, working for Pinkerton’s National Detective Agency. But there’s no other place for Nell, so the two of them end up traveling undercover to Philadelphia, Mississippi, and New York City to solve a series of mysteries. Their final case brings them to Baltimore, where Nell proves herself once and for all by helping Aunt Kitty thwart an assassination attempt on the new president, Abraham Lincoln. Grades 4-7. Pros: The author’s note explains that Kate (Kitty) Warne was a real person, the first female detective in America. 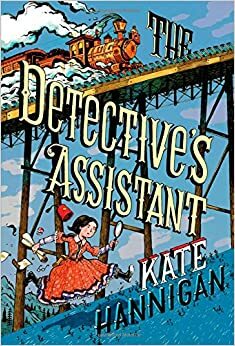 Both she and Nell are strong, spunky characters that are fun to read about, and their adventures read like a series of 19th-century Nancy Drew mysteries. The subplot about Nell’s father, Kate’s husband, and their involvement with the Underground Railroad just before the Civil War add interesting historical details. Cons: Although the letters between Nell and her friend Jemma helped explain some necessary background, they sometimes felt like an interruption of the main plot. 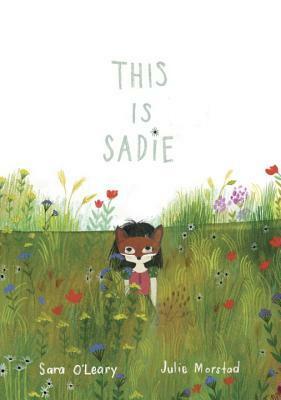 This Is Sadie by Sara O’Leary, illustrated by Julie Morstad. Published by Tundra Books. Summary: This is Sadie, sailing in a boat made from a cardboard box. And this is Sadie, being a mermaid in the pool with her friends. And checking her back to make sure her wings are in place. And chatting with the birds at the top of a tree. The days aren’t long enough for Sadie to do and make and pretend all the things she thinks up. More than anything, Sadie likes stories, “because you can make them from nothing at all.” Ages 3-8. Pros: This brief and beautifully illustrated book is a celebration of a young child’s imagination. Cons: Sadie seems like an all-too-rare phenomenon: a child who can entertain herself without ever having to plug something in. Summary: Little Miss is excited to be a big sis. Told entirely in brief rhyming couplets (“Sleep. Fuss. Eat. Repeat.”), the story follows Little Miss from the revelation of the big news through the first year or so of the new baby’s life. Little Miss proves to be a fabulous big sister, helping to stop tears and for the most part ignore little annoyances as the baby gets old enough to play. It looks like many happy years ahead as the book ends with a picture of Little Miss passing a love note from her top bunk to the baby on the bottom one. Pros: Rosenthal and Reynolds team up for another winning picture book, putting a rosy spin on getting a new baby in the house. Cons: The book doesn’t explore any of the less positive feelings associated with a new baby in the house.